If it isn't fast… It isn't us! The Nacra 20 One Design has a pedigree all of her own – she’s the platform of choice for grueling offshore events like the Tybe 500! The 20 is a one Design racing class where competing crews have identical platforms in a true test of skill. The 20 has a huge spread of power some 49 sq.m (527 sq.ft) of sail area when heading downwind! The rig stands some 9.75 meters (32′) above the platform, it’s imposingly powerful and tends to dominate the beach scene. But far from being unwieldy, the mast is in fact, a wingmast which allows the power of the wind to be harnessed or de-powered during times of strong wind. Dialing in the rig is achieved simply by adjusting the mast rotation and playing the mainsail down-haul. Two ‘strings’ accomplish this feat from trapeze on either tack. All foils are the high-aspect variety for the best windward ability and control when heading downwind at ‘maximum-sized boat speed figures’! The hulls have a relatively flat-bottomed shape to generate lift and with the ends free of water, effortless tacking and jibing. The hulls are constructed from vinylester foam sandwich and are the lightest hulls?volume on the market. they are also extremely stiff in order to be able to handle the incredible loads that are placed upon the platform by the powerful rig. The sail plan has been designed to work with the wingmast with the Pentax mainsail allowing complete control over the twist for speed. The jib is a fully battened ‘blade’ type and self tacking. The spinnaker is the “one-string” system that allows for simple deployment and retrieval under any circumstances. The mid-pole snuffer allows the crew to keep the spinnaker fully powered up until the last second before dropping the kite. 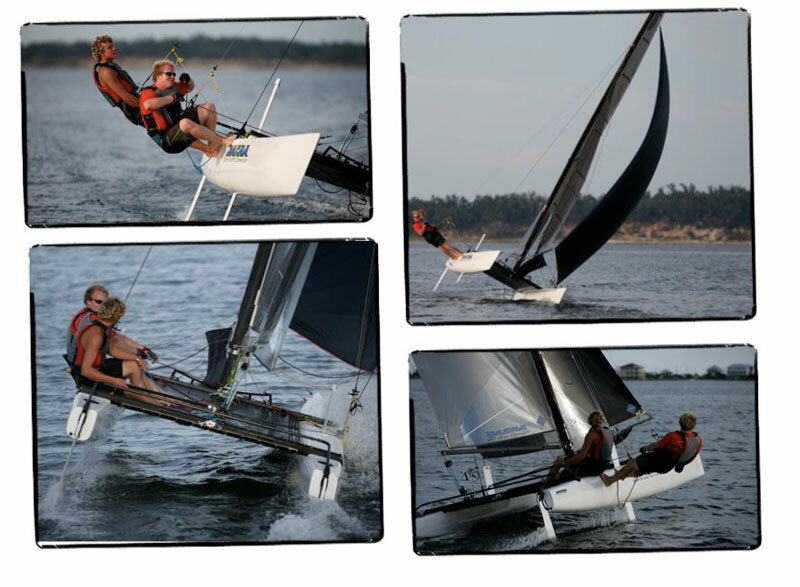 Being a premium Race Cat, the Nacra 20 comes only in the ‘fully blown’ version. This includes the most impressive rig on the beach, full race sails, high-aspect foils and 25 sq.m of spinnaker. This is the line honours boat if ever there was one! Double trapeze, maximum! !